For a Florida truck injury lawyer with a proven track record, call the Kramer Law Firm. If you lost a loved one or suffered serious injuries in a truck crash, hiring an experienced attorney is especially important when injured in a Florida trucking accident. Trucks may be vital for the Central Florida economy: they do serve as the lifeblood for many of our industries. But trucks can also be extremely deadly instruments, due to their size and mass. A 20-ton truck will exert much greater force than a standard sedan, in a situation where change in velocity is equal. When these behemoth vehicles crash, they are far more likely to lead to serious injuries and fatalities. Many trucking companies retain their own team of attorneys to protect their interests. You are much more likely to be up against the trucking company itself or a large insurance company, not the truck driver. 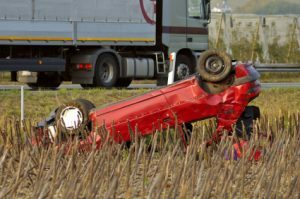 When serious injury or wrongful death is the result of a tractor trailer accident, retaining an experienced Florida truck accident attorney is perhaps the most important thing you can do to ensure you are fairly compensated and protected. When you hire an experienced Orlando truck injury lawyer at the Kramer Law Firm, our team will immediately go to work to protect you, and aggressively take action to obtain compensation, justice, and closure for you. Truck crashes can be similar to accidents between passenger cars. No one type of driver has a monopoly on negligence and carelessness. Way too many drivers (of all vehicles) still drink and drive; text and drive; drive on too little sleep; drive under the influence of sedating prescription medications; and drive while angry or otherwise emotionally volatile. Truck accidents can also be quite different than car accidents. Truckers, for instance, must abide by many more rules and restrictions. A commercial driver has limits on how many hours per day (and per week) he can drive. He also needs special certifications and experience. Many truck accidents are found to be in violation of Federal Motor Carrier Safety Regulations, and your truck injury lawyer must be fully knowledgeable of these and other regulations. Truck crashes are not always due to truck driver error, but the trucking company may nevertheless be liable for the accident. Badly maintained or poorly stowed or carelessly inspected trucks can break down and cause catastrophic consequences. For instance, a poorly tethered load can break off in the middle of the highway, creating a horrendous hazard in the middle of traffic. A skilled truck injury lawyer is equipped to fully investigate and interpret all of these scenarios that can be at issue in a trucking accident case. A good trucking attorney is also aware that many trucks carry “black box” recording devices, using a similar principle to those black boxes in use on commercial airplanes. These black box recorders can yield very valuable information about how an accident occurred and can have a huge impact on a truck accident. Insurance companies that represent any or all of these parties. Although you may not feel strong enough to take swift legal action, time is likely of the essence. If you delay, you may lose important evidence from the scene of the crash and witnesses may forget what they saw or become unreachable. Our Florida truck accident attorneys can investigate what went wrong in your crash and act energetically and intelligently to protect your rights and ensure that you retain all legal options. Our goal is to make the process as simple and stress free as possible for you. We want you to focus on getting your life back on track while we handle everything relating to your case. We are here to take care of you and provide you with an attorney that will handle your case from start to finish. Let an accomplished tractor trailer and truck injury lawyer handle your case and work to get you the best result possible. Call the trucking accident attorneys at the Kramer Law Firm now at 855-Kramer-Now (855-572-6376) for a free consultation.